All the World Will Be Your Enemy Trailer: Watership Down! Watership Down – Hazel faces Woundwort – Image courtesy of Netflix. Richard Adams’ novel Watership Down tells the story of a band of rabbits that are forced to leave their cozy warren because of encroaching technology – and the dangers they face on their journey to find a new home. Already adapted as a brilliant film from Martin “Short, the BBC and Netflix have partnered for a four-episode limited series CGI adaptation of the story with a terrific cast that includes John Boyega, James McAvoy, Nicholas Hoult, Olivia Colman, Ben Kingsley, Gemma Arterton, Daniel Kaluuya, Rosamund Pike, Gemma Chan, Peter Capald, and Taron Egerton. Watership Down will premiere on Netflix on December 23rd and on the BBC December 22-24. Check out the trailer below. You Came Here for Permission Trailer: Dark Phoenix! The film mutant fans have been waiting for is almost here. Split – Shyamalan’s Best Since Unbreakable! SPLIT – (L to R) Casey (ANYA TAYLOR-JOY), Claire (HAYLEY LU RICHARDSON), Marcia (JESSICA SULA) and Hedwig (JAMES McAVOY). Photo by John Baer/Courtesy of Universal Pictures. It’s been a long while since M. Night Shyamalan has produced a movie that’s as good as Split – just over sixteen years, in fact (since Unbreakable). He’s come close before – sixteen months ago, he almost did it with the fatally flawed The Visit – but he’s finally put it all together in this tale of three high school girls’ kidnapping by a man suffering from Dissociative Identity Disorder (DID). One of Kevin’s 23 personalities has kidnapped three girls – for a yet-to-be-revealed 24th personality. The second trailer for M. Night Shyamalan’s Split is dark, twisted and bizarrely witty. It suggests that the director is back to his The Sixth Sense/Unbreakable level of quality. Check it out after the break. Split opens in North America on January 20, 2017. 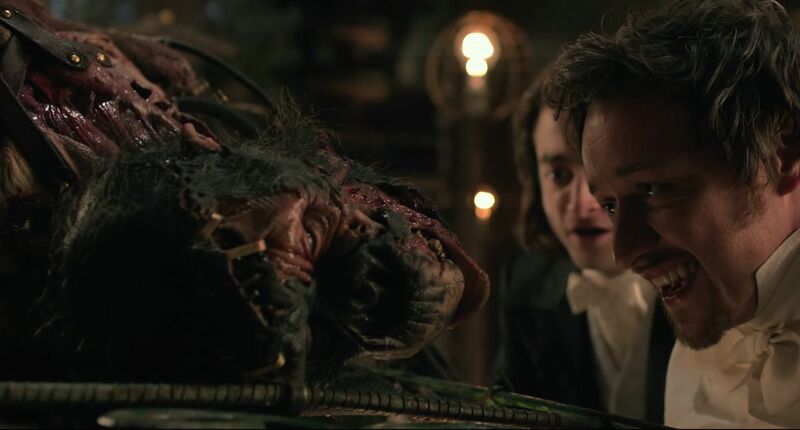 Igor – I Mean Victor Frankenstein – Not Worth The Wait! Then we got a cool a trailer and a few really cool clips. It was all good. And then it all came crashing down. Those cool moments form the trailer and the advance clips? They’re pretty much the sum total of the movie’s good moments.